Native American themes are common in the world of online casino slot games. In order to stand out in this crowded genre, a slot needs to look good and have some great game play too. Native Treasure from Amaya is an older video slots game. While it manages to be a solid game (with potential for big wins via randomly awarded free spins), it is starting to show its age compared to many online titles. There are 30 win lines crossing the 5 reels of this slot, and it is an older chief that you’ll want to see appearing often. This is the wild symbol, with the usual stipulation that it can substitute for everything except the scatters (dream catcher). The chief is also the biggest paying symbol, worth a generous 5000 coins for 5 on a line, 2000 for 4, 200 for 3 and 10 for just 2 from the left. Next on the pay table is the female Native American, worth 1500 for 5 – with the American Eagle the next in line at 500. Both of these symbols also pay all the way down to 2, though the remaining ones all require 3 or more. The axes and pipe are the other unique regular symbols, with playing cards ace right down to nine making up the small wins. Scatter symbols look like a next over a circle with feathers around the outside. This is a ‘dream catcher’, and pays a multiple of your total bet for between 2 and 5 on the reels – as well as triggering the bonus game. You get 1x your bet for just 2, 5x for 3, 20x for 4 and a generous 100x for the full set of 5 anywhere on the reels. If you get 3 or more in one spin, then you see a sequence with a large size dream catcher which covers the reels. This shows a number of free spins, which can be anything up to 100 each time. Next the background of the reels changes to a night time scene (a common cliché for spins rounds in Native American themed slots) and some chanting type music plays. Under the reels you will see the controls change to keep track of how many spins you have left and show your accumulated winnings. All wins during the free spins are doubled compared to the pay table. With 100 free spins at 2x prizes, you could come away with a nice windfall! This slot does show its age in terms of the overall look. The background shows a lovely scene with red rock formations, with totem poles either side of the reels acting as the line number markers. The reels have plain pale background, and the symbols are blocky and simple when compared to those you will see on more recent slots. The best of these are the chief and the female characters. There are no real animations, though the symbols flash when forming part of a winning line. When you hit the free spins you will see a more effective graphic in the form of the big dreamcatcher. The background for the free spins is nice, though again you can see that this is a graphic made before the newer generation of computers was around. Sounds include a strange noise when the scatters land, and then mostly the standard electronic beeps. Only the chanting in the free spins game really adds to the theme. The setup is a 5 reel, 3 row grid with up to 30 win-lines. You can choose how many lines to play and how big you want to make each coin. You can play from 1c per line up to $6 for a spread of 30c to $180 for each spin. The standard Amaya configurable auto play is available, as is the useful ‘bet max’ button. There is no doubt this is a solid game, which obviously benefits from years of experience with the traditional type of slot gaming. Whether simple wilds, scatters and a free spins round will be enough for you to enjoy the game really depends on your personal preferences. 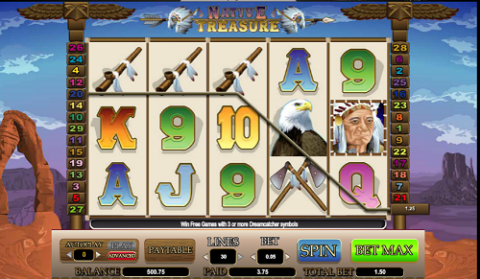 Native Treasure does manage to hold its own in this crowded online slots niche. The free spins round at 2x wins with up to 100 spins each time is certainly the highlight.